The most thoughtful and heart warming Valentine's gift is one you make yourself. 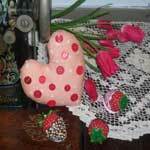 Add flowers or candies to a special gift you made for your valentine. 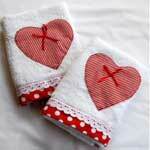 Beautiful heart shaped pillows, heart towels and lovely scented items can be easily crafted with the use of these Valentine's Day patterns. 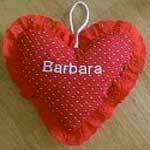 Give a gift of a heart from the heart by sewing a special Valentine gift. 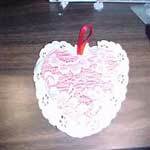 Here is a lovely project and just perfect for a Valentine's Day gift or to hang on the door. 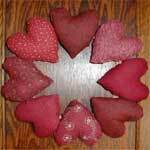 So very sweet and easy to make, you will love giving this heart pillow to your honey. 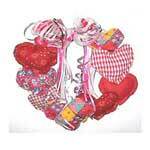 A great Valentine's Day gift for a little girl or to hang on a door knob. 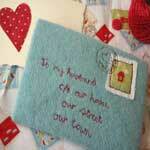 You can sew up a love letter to your loved one by following these instructions. Instructions to make a cute heart pillow with buttons on it. 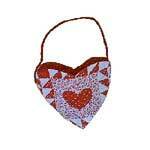 A heart sachet that's a perfect Valentine's Day gift but also great for other occasions. 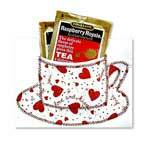 Here are two projects for Valentine's, a blouse & tea card. Use these simple instructions to make a cute heart wreath. Great for Valentine's Day decorations. 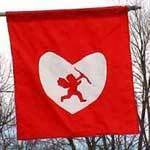 Here is cupid with his arrow on a yard flag that you can easily make yourself.